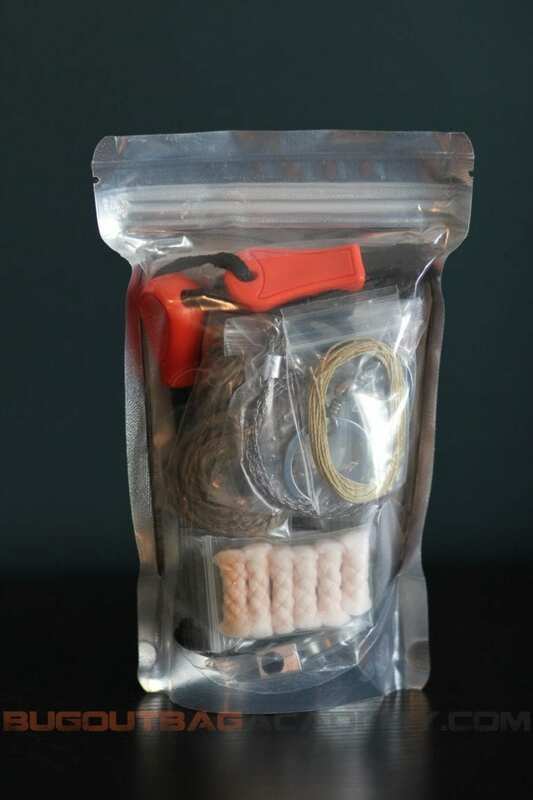 Survival fire kits are a core component of any bug out bag, but as with many aspects of a bug out bag list, many also wonder what to include on their fire kit list as well. Well, wonder no more. 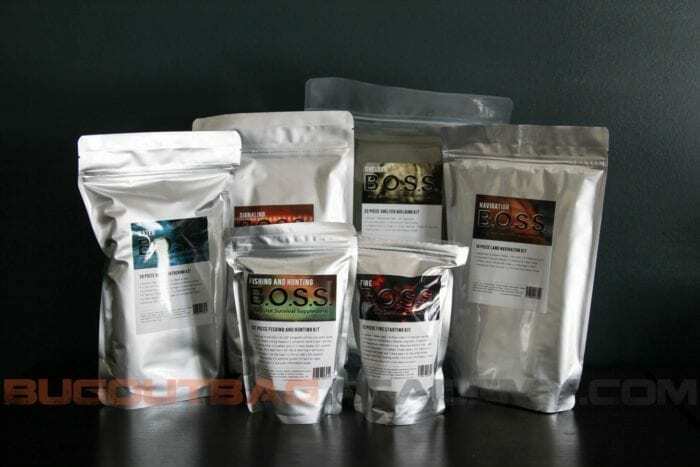 Stanford Outdoor Supply has just come up with the perfect grouping of 5 star ready-made survival kit supplements including the BOSS Fire Kit (“B.O.S.S.” = Bug Out Survival Supplement). But before we breakdown this kit in a review, why is having a fire kit for your bug out bag so important? The BOSS Fire Kit comes in a compact, resealable dry bag to keep your gear… dry, again and again. Each item is individually wrapped to further protect from moisture getting in. Having the ability to make fire means you can warm up, dry out, boil water for drinking, and cook food. It lights up the night, signals for help from far away, keeps the mosquitos at bay, and also chases away the boogeyman. Fire has a strong psychological aspect, too. It gives us a sense of control in a situation that seems to be largely out of our hands. Plus, who doesn’t find a campfire relaxing? The very presence and warmth of fire can help reduce stress and anxiety, allowing you to clear your head and plan your next move. Having a compact and lightweight fire kit on hand goes a long way toward bringing peace of mind in a stressful emergency situation. To be successful in making fire, you need three ingredients. First, every fire needs oxygen, it needs to be able to breathe. In general, what we mean by this is if you smother the fire by adding too much too quickly, you’ll never get beyond a smolder. Second, fire needs an ignition source. This could be a lighter, a spark, friction, or even a chemical reaction. The fire needs an initial burst of heat to ignite. The third element needed is tinder. This is some kind of material that is easy to light. Natural sources of tinder include plant fluff and dry grass. There are many store-bought as well as homemade types of tinder, too. What does the BOSS Fire Kit Include? The B.O.S.S. Fire Kit is extremely compact and lightweight. Weighing just 8oz and measuring roughly 7.25″ tall x 4.25″ wide and at its widest point at the base, 2.75″ deep, this survival fire kit is easy to pack and be on your way. Great thought and care was put into the Fire BOSS to make it extremely useful, affordable and lightweight. The BOSS Fire Kit comes equipped with several tools for starting your fire in a handy, sealed fire kit pouch. The easiest one and the item you’ll want to try first in most cases is a simple disposable lighter. Storm proof matches are next up. Both of these provide instant flame, which is often all that is needed. The Fresnel magnifier is great when the sun is shining. Many of us spent at least a little time in our youth burning holes in leaves and such with a magnifying glass. Same principle is at work here. The ferrocerium rod and striker is my personally preferred method for starting a fire. You hold the rod in one hand, just above and sort of pointed at your tinder. Hold the striker in your other hand, keeping it firm against the rod and up at the end nearest the handle. Pull the rod toward you quickly, pressing the rod and striker together tightly. The striker will scrape sparks off the rod and shower them down into your tinder. The tea light candles are sort of a bridge between ignition and tinder. The candle needs to be lit by something, of course. But, once the candle is burning, you can use it to light your tinder without expending a lot of fuel from your disposable lighter or striking several matches in succession. The Kevlar thread and flange bearing are used when making a bow drill. The assembly and use of a bow drill is far beyond the scope of this review but Sanford Outdoor Supply has conveniently included in the BOSS Fire Kit instructions for making a bow drill. The BOSS Fire Kit comes with several types of ready-to-light tinder as well. Each of them comes in a plastic fire kit pouch or some other type of packaging to keep it dry. The char cloth is fabric that has been brought almost to the point of ignition before being cooled down. A simple spark will be enough to get it burning again. Fatwood is pine that is saturated with sap. It burns fast and hot and will easily get a fire going. Tinder tabs are made of specially treated cotton. Take one and pull it apart at the ends to fluff it up, then light with flame or spark. Jute twine is a great dual purpose item. Every survival kit needs cordage and jute twine is a great option for that. Additionally, you can cut a small length of a few inches and pull it apart into smaller fibers and it will light easily and burn well. There is also a WetFire Cube included in the fire kit. This is a petroleum based product that burns quite well. Open the package and shave off some of the white cube into a pile and light it up. Magnesium burns very hot. The BOSS Fire Kit comes with several capsules filled with it. Pour one out into a small pile and light with a spark from the ferrocerium rod. The steel wool requires the addition of a battery to the kit. Pull the steel wool into a rope shape and hold the ends of the rope to the ends of the battery. The wool should ignite in short order. There are many homemade types of tinder you could add to the BOSS Fire Kit as well, such as a plastic bag containing cotton balls that have been soaked with petroleum jelly. Dryer lint is another option, provided most of your clothes are cotton or other natural fibers. There are also a few tools included in the BOSS Fire Kit that make it easier to process bits of firewood for the fire. The pencil sharpener is used to create wood shavings to use as tinder. Just take any stick or twig about the same size as a pencil and shave it down. The wire saw works well for cutting dead branches off trees as well as making longer branches easier to transport. The knife can do trimming or make fuzz sticks. Plus, every survival kit needs a knife, right? 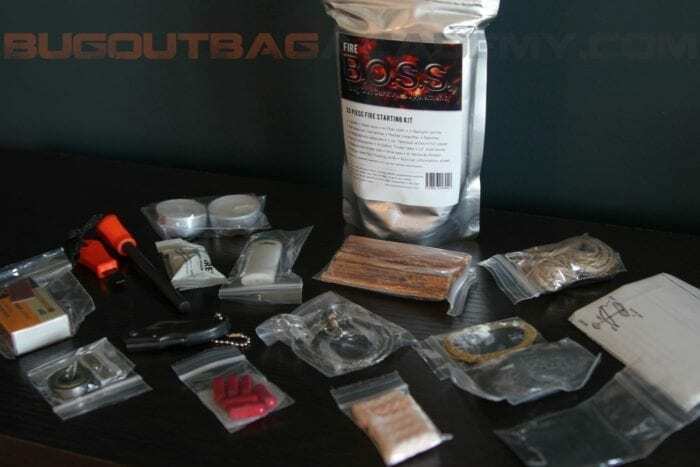 The BOSS Fire Kit is a great addition to the bug out bag. It contains so many options for fire making that you’ll probably never use all of them but you’ll be glad they’re there, just in case. Can you put together a fire starting kit of your own using items from elsewhere? Sure you can, but I’m thinking you’ll be hard-pressed to find a better deal than this, especially when you factor in the time and energy it would take to compile it all. And overall, we rate this as one of the better, more affordable pre-made survival fire starting kits on the market. The BOSS Fire Kit currently retails for $22.99 on the Stanford Outdoor Supply website, which is $7 off their normal retail price. 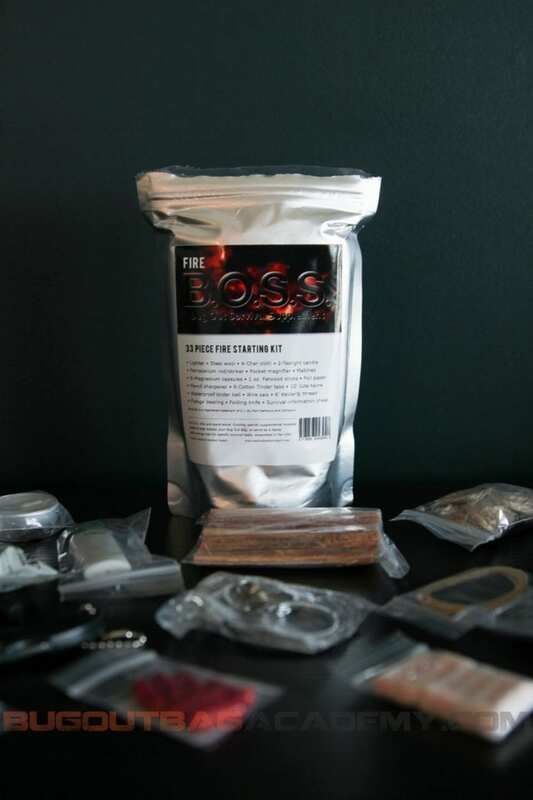 Be sure to check out the BOSS Fire Kit along with the other supplemental kits below that Stanford Outdoor Supply has to offer. You’ll be glad you did. Stanford Outdoor Supply has a whole line of BOSS Kits to suit the most common of emergency scenarios. Do you have or want a BOSS Fire Kit or something similar? Let us know what you think in the comments! — If you enjoyed this article and want more like it, let us know by sharing, liking, and commenting on this post. Have questions you need answered or have an idea of what we should cover next? Let us know in the comments below! We are pleased and excited to welcome the highly esteemed Jim Cobb to Bug Out Bag Academy ranks. Jim is the owner and lead trainer for DisasterPrepConsultants.com. His seasoned experience and witty, well articulated articles on preparedness have been published in national magazines such as OFFGRID, American Survival Guide, Survivor’s Edge, and Boy’s Life. You can find him online at SurvivalWeekly.com. His growing stack of accomplished books on emergency preparedness include Prepper’s Home Defense, Prepper’s Financial Guide, and Prepper’s Long-Term Survival Guide, among others. Jim lives in the Upper Midwest with his beautiful wife and their three adolescent weapons of mass destruction. Hi, Paul. Great suggestion! I just grabbed some measurements for you. The BOSS Fire Kit weighs 8oz and measures roughly 7.25″ tall x 4.25″ wide and at its widest point at the base, 2.75″ deep. Hope this helps! I like how you help everybody. There are a lot of people not prepared. Some will listen some dont. The that dont won’t make it. Especially those who font care until to late. People remember North Korea can’t be trusted nor china. I like everything you put together. To help everybody to be prepared. Thanks, Roy! We try to do what we can with what we have!